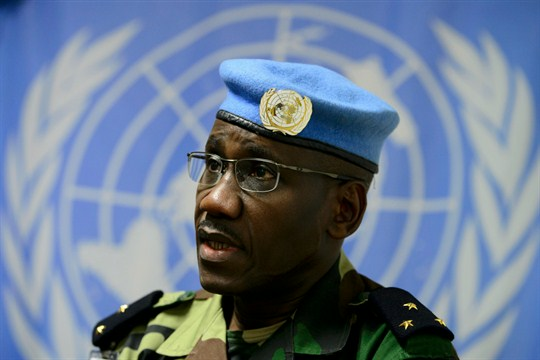 Senegalese Gen. Amadou Kane, deputy force commander of the U.N. mission in Mali, sits for an interview, Bamako, Mali, June 23, 2018 (Photo by Sean Kilpatrick for Canadian Press via AP Images). From Bosnia to Rwanda, United Nations peacekeepers have always faced tough choices that come with operating in complex, dangerous environments. Today, the climate is no less challenging. Record fatalities and injuries for U.N. personnel have increased pressure from some quarters to embolden U.N. peacekeeping operations and political missions with stronger, more aggressive mandates. But recent decisions made by the permanent members of the U.N. Security Council, such as a mandate to support a regional, non-U.N. counterterrorism unit in Mali, the G5 Sahel Joint Force, risk plunging blue helmets into the quicksand of unwinnable wars. This short-term thinking poses considerable long-term risks that could destroy U.N. peacekeeping as we know it.